My husband is getting ready to go to a central Asian country to teach. Originally I had hoped to be able to go as well but because of my unresolved residency card situation, I told him I'd rather not go anywhere. Anyway, the family he is going to see has three girls - let's call them S -10, R - 8, and N - 7. I had an idea last Friday. I asked my husband, "Did I ever make those girls quilts?" A few years ago we had visited them when they lived elsewhere and I got the information about their favorite things. He assured me that I hadn't done it! Oh my. I had to rectify that situation! I asked my husband if he would be able to take them quilts if I could get them done. He is allowed a regular suitcase plus his carry on. He said, "Sure". Then he asked his friend what the girls' favorite things are. S, the 10 year old said, "Horses". R - the 8 year old said, "Big cats". N - the 7 year old said, "Pandas". Hmm...I thought. I can make quilts I suppose, (I hoped!) with these motifs/animals, but still don't know what they like very well - so I asked my husband to ask their dad what their favorite colors were. S, the 10 year old horse fan likes turquoise. R, the 8 year old who loves big cats loves blue, and R, the 7 year old who likes pandas loves pink. 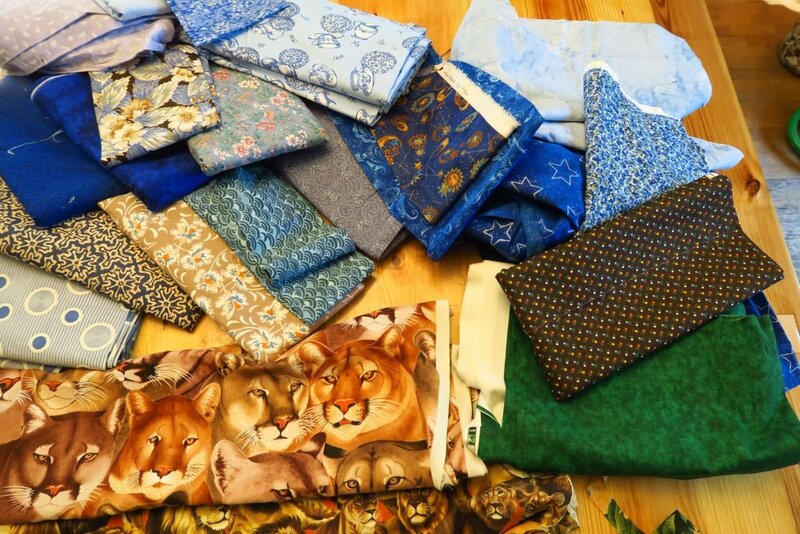 I went into my stash and uncovered some big cat fabric - stuff I didn't remember having. Thankfully my twin sis organized it all in 2016 and it remains organized for the most part. I was able to find both horses and big cats! I also found pandas in with my plastic boxes of leftover scrubs fabrics in with some things we had bought from a lady back in 2015 who apparently had a relationship with a company who made scrubs including some yardage and not just tiny pieces! These fabrics are beautiful! Anyway, there were two panda fabrics there! Yeah! You don't know how happy and relieved I was! But now, to match the favorites colors with these fabrics/motifs. That was quite another matter. Turquoise and horses? Most of my horse fabric was green - but turquoise wouldn't look very good with it. I had decided to work with it - mixing in various greens and blues on each side of turquoise! Then I looked elsewhere in my stash and I found 2 more pieces of horse fabrics- the ones in the front of this picture- and one of them was perfect for matching with turquoise. I was trying to find fabrics that would be defined as turquoise. My daughter in law helped me understand which of these is defined as turquoise, which is teal and which is just blue. Once again, I was excited! That one was taken care of! At least I had fabric I could use. Now, back to actually figuring the other ones out! Big cats and blue? Now why couldn't she have chosen green or brown? This one was a challenge. The big cats were mostly browns and greens - no blue anywhere to be seen. Oh well. I decided I would have to tie it together with the fabrics I used. I'd try to find some browns/blue in one fabric together. and then figure out a pattern that helped them get together. I discovered to my chagrin that this is a weak spot in my very big stash. Brown/blue fabrics - where both brown and blue are in the same design - I had almost none. It was very sad. This is what I came up with to choose from. But pink and pandas? Wow. That was tough! My panda fabric had brown and green as the black and white pandas were sitting in trees. In my mind I went everywhere from black and pink and green to brown and pink and green. I ended up with brown and pink and green. The girl is only 7, so since she loves pink, I wanted to make sure it was VERY pink. This is what I decided on. My daughter-in-law helped me choose these. I didn't know how to get from the pandas to pink, though. I had one piece and ONLY one piece of fabric that was brown and pink and green. I had used it recently in my own granddaughters' quilts (you've not seen them yet) but I had more of it leftover and so it got thrown in the mix - hopefully it would be the main coordinator trying to tie brown trees that the pandas were sitting in to pink that she loves so much. OK. Now that I chose my fabrics, I had to come up with a pattern. I suppose that's backwards for many people, but not for me. I find it is more often the norm for me - basically since I'm trying to use what I have. Buying stuff is pretty slow and tedious (and expensive at the prices here in Poland), so using my very large stash makes complete sense to me. As a result, I need to look first at my fabrics I can use and then come up with the pattern. So, I did. I came to the computer and opened up the Electric Quilt (EQ) program. I decided to make the blue, big cats quilt first as it seemed the easiest to me. I made the top on Monday/Tuesday (I had to spend several hours helping another lady and couldn't spend all day on it). Then after I finished the blue, big cats top, I decided on the turquoise and horses design and began. I made this one harder on myself as the girl is 10 - a preteen. By the time they are getting to be that age, girls often begin to care about design and such. They notice things. This is my part of my very big stash that my sis organized. The top sections are where my wild animals are. i have mostly animals found in Alaska, though - not tiger, lions, and pandas! Horses and turquoise? To me that screams "Southwest" - even though they live in central Asia! I didn't want to make it too southwest, but definitely wanted at least a bit of that feel, so I knew I needed some triangles in it. You'll see. That one took quite a while to make - but I finished it on our holiday, August 15, in the middle of the afternoon. I had spent most of Tuesday afternoon working on the sashing pieces. I can't remember the exact timing of it, but I definitely have had my nose to the grindstone! Once I got the oldest girl's top finished, I came back to deal with pink pandas. I figured that it needed to be very pink and simple. She's only 7 and kids at that age really like what they like. In her case - pandas. I came back to the computer and my trusty Electric Quilt program and figured out what I could do with that one and began work on it. I finished the pink pandas top on Thursday - about 5:30 pm - I had had to stop and do some more errands and fix dinner, etc. All of these tops aren't all that big - they are a typical European single size - about 150 x 200 cm or 60-65"x 80"-85". You'll be seeing these three tops soon - This post isn't really about the tops themselves - instead, it's about "how" I decided to do what I'm doing. Some of you have indicated you wanted to know how I come up with these designs. This is sharing at least part of the process to you. I knew when it came to the designs themselves, I wanted to keep the main thing the main thing. That meant that each animal piece needed to stay big. I didn't want to chop them into tiny pieces. I also wanted to keep the colors the girls chose as their favorites as obvious. I mean, OBVIOUS. I didn't want the girl who likes blue and big cats to wonder if I was featuring green or brown and big cats. It needed to be blue. The same with turquoise and horses, and pandas and pinks. So, as you see these tops over the next week or so, you may smile at my interpretation. But at least you'll know WHY I've done what I've done. Check back after the weekend for more about this project! I've had less time to write patterns because I really need to finish these 3 tops/quilts before my husband leaves in a few days for his trip. The plane's got a schedule and these quilts hopefully will be there - unlike a lot of things I make, there is no flexibility to this timeline! And that's what I've been up to with quilting! Added on Saturday. As I was working on quilting the first quilt yesterday, Friday, I was approached by my husband who had his friend ask me if I'd have time to make a quick and easy wedding quilt for a couple getting married over there. It's a big deal in this country, and my husband is going to get to experience it. I turned around from my chair while I was quilting and said, "You're kidding, right?" I sat stunned. Speechless. I've never been to this country. Never experienced their culture! What's the bride-to-be's favorite color? "Wait. No, blue - light blue." What's App was getting a workout. Ok. I have blue and light blue. Lots of it (not upcycleds but plenty of new). "Let me think about it," I said. "I can come up with something!" Then my mind got busy. These three were almost done. Hubby isn't leaving until Thursday. That gives me until then to make a special wedding quilt for a young couple from a completely different culture from mine to design, make and quilt (and wash) and label, as it turns out. My husband suggested that I give them one from my upcycled blues quilts. I said, "Well...maybe, but I'm not really ready to get rid of those yet until I get the whole series done and get pictures with ALL of them together." Once one of them heads out yonder, that won't be possible. Plus, this is a wedding! Shouldn't it be from new fabrics made especially for them with brighter colors and new fabrics? My heart says, "Yes, if at all possible". Well...as I'm adding part on Sat. about noon, you know what I've got going for the next 5 days....when I can. I have some things already scheduled here and there. And now you know...that's what's been going on in my part of the world - at least having to do with quilting! Thanks for checking in today! Have a great day wherever you are reading this!